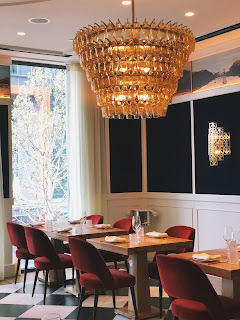 Famous D.C. Italian Chef Fabio Trabocchi of Casa Luca (named after his son Luca), Sfoglina, Fiola Mare, and Fiola has opened up Del Mar with his wife Maria to celebrate her Spanish heritage and family traditions. Located on the District Wharf, Del Mar serves traditional Spanish dishes and authentic seafood fare with a luxurious and modern twist. Walking into Del Mar, I was immediately transported back to Spain, as if sitting on a patio along the gran via of Madrid eating patatas bravas and drinking wine. The impeccable atmosphere is just the beginning of your experience at Del Mar. We attended the brunch, which had to start out with their classic brunch cocktail, the Sangria Roja. The Sangria was the star of the show, with a beautiful carafe full of red wine, vermouth, vodka, and orange flavors and thick Spanish glasses with colorful frozen fruit and flowers instead of ice. 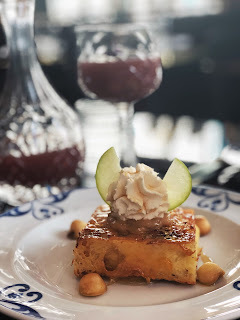 The Del Mar Signature Brunch ($52) includes a choice of one Tapa, one Main Course, and one Postre, as well as their signature Torrijas (french toast) for the table. Instead of a soggy spice bread, the dish is all at once crunchy and soft, with a crisp, caramelized outside and a tender inside. This was by far the best french toast dish I have ever eaten, with sweet Honeycrisp apples and a bold cinnamon flavor! Their unique Croquetas de Jamon and Patatas Bravas, both served with garlic aioli and tomate sauce, were my favorite tapas dishes. They also serve multiple Spanish charcuteries, such as Chorizo Ilberica, Sobrasada, and Jamon Mangdlitsa. Morcilla con Manzanas, a soft pan seared blood sausage dish with crushed potatoes, caramelized apples, and gooey poached farm eggs. 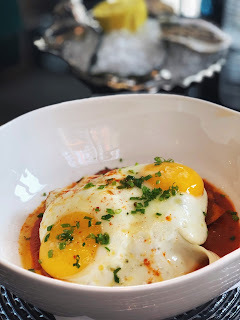 Huevos Estrellados Mallorca, a giant bowl of crispy potatoes in tomato sauce topped with two sunny-side-up farm eggs. The most unique thing we ordered from the brunch menu was the Bocata de Calamares, a delicious housemade chorizo burger with crispy calamari and piparras aioli. Chef Trabochhi's creation, sandwiched between a bun infused with squid ink and topped with olives, made me excited about Spanish flavors again! I have gotten tired of the same old dishes at every Spanish restaurant, but Trabocchi has reminded me why I love Spanish cuisine! Del Mar also has a raw bar with Oysters, Pescado Crudos, Seafood Towers, and Caviar. To end brunch, we had Italian espresso shots and brandy with delicious sweet bites from the chef. Other menus from Del Mar include a small Presto Menu Tuesday-Friday, serving a drink and entree for $20 from 11:30am-2:30pm, a Sunset Menu at the bar, only served Tuesday-Sunday from 2:30-5:00pm, Happy Hour specials at the bar Monday-Thursday from 4:00-5:30pm, regular lunch and dinner menus, and speciality Holiday Menus for Thanksgiving, Christmas, New Years Eve, etc. 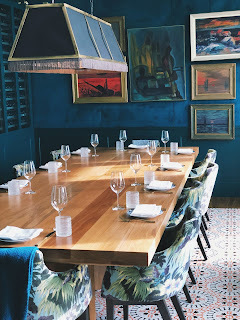 Del Mar has a beautiful dining, bar, and patio area for all guests on the main level, but Chef Fabio and Maria wanted to create special places for people to celebrate together while enjoying their Spanish Coastal cuisine. They designed Prive, elegant spaces upstairs for private dining. The restaurant has multiple different rooms to reserve with distinct character and ambiance. The interior design is Barcelona-inspired, with colorful cement floor tiles, original artwork, custom light fixtures, handcrafted furniture, tableware directly from Spain, beautiful fireplaces, and large window frames. The private rooms available include the Nautico room which seats 8-10 people, the Biblioteca Room which seats up to 50 guests, and the Formentor Room which also seats 50 people. The Palma Room seats 10-12 guests, as well as the Picasso Room. The Terraza outside patio seats up to 45 guests, and has beautiful views of the Wharf and Marina.